Dotty 2 months before her death, why did she look better than she had in over 8 years? Click to play and listen. why did she look better than she had in over 8 years? I'm sitting here thinking about my mom, Dotty. Many of you are new here to the Alzheimer's Reading Room, so let me bring you up to date. 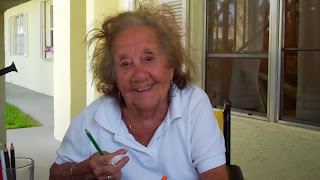 I took care of my mother from November 17, 2003 until she went to Heaven on May 25, 2012. It is not unusual for Alzheimer's caregivers to go 8 or more years in their role of primary caregiver. Caregivers are now often called Care Partners by the way. It was never intended but Dotty became a much beloved character worldwide here on the Alzheimer's Reading Room. As I think about that I am really amazed. If you want to get a sense about how our readers felt about Dotty (and me), you can find quite a bit in our archive from the month of May, 2012. Go here, the archive starts at the end of the month, so you will need to scroll all the way down the page and start reading from the last article. I started writing about Dotty, and more specifically about what Dotty and I were doing, thanks to the advice of Tony Polk. He strongly suggested that I do it, and I did. Thanks Tony. There are so many things that stand out about Dotty, it would take a long time to relate them to those of you who are new. Of course, it is all here on the ARR so you can search for more about Dotty. We started writing seriously in 2009. One thing that always stands out is the video I made with Dotty and Jeannemarie two months before Dotty died and went to Heaven. I continue to watch that video and it amazes me every single time. See it YouTube. Go here and play the first video listed on Dotty Live. Don't forget to Like and share the videos with others. Dotty was so lucid and so communicative. You could also see her vulnerability. I cannot believe that video, it is really remarkable. When I speak publicly I always play that video. People laugh and at the end they clap. Every time. Every time I feel amazed. One thing for certain, the video proves a point I am always trying to make -- you get to decide burden or Joy? For those of you that are new, here are some links to Dotty. For those of you who have been with me a long time, you might need some Kleenex. This article will bring the video I mentioned into focus - Share Dotty with the World. Here is a link to very nice article Pamela Kelley wrote about Dotty a few days after her death - Did Dotty Survive Alzheimer's? Judith Graham also wrote a very nice article about us after Dotty's death - Blogger’s journey in ‘Alzheimer’s World’ brings perspective to national plan. This one will really remind Dotty's fans of the feisty old girl - Dotty Said, "That Woman is an *ss".